I don’t know if I can remember the very first thing. But I do remember, after I left secondary school in 1967, and was working at a bank, I began to write a sequence of poems in an exercise book, which I recall, was about my father. Before that, at school, while I had always done well at literature and languages, I never wrote creatively. 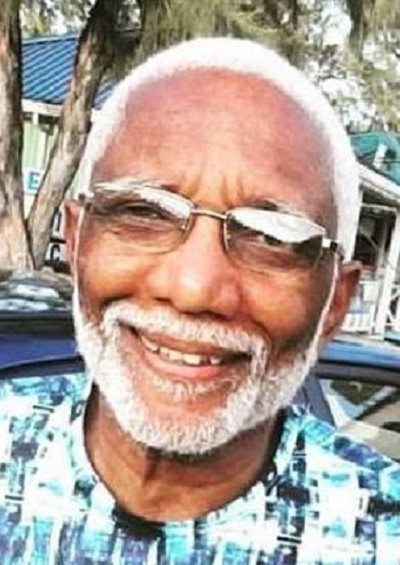 My first poems were published in 1970, in Link magazine, a St. Lucian literary journal, edited by Barbadian Stanley Reid who was living in St. Lucia. Two poems, titled “John 3:16” and “Rainbow.” One a religious theme, the other on racial issues. I was then at Cave Hill UWI, where as a literature student, I had begun to write in a more focused way. Link magazine, the first of its kind in St. Lucia, ran from 1968-1970. Caribbean Literary Heritage will be pleased to know I have those issues, well bound. While I move easily between free-forms and more formal type verse, I like the discipline given by formal structures, those I copy or those I create. I am strong on music, image, metaphor, beauty of line, in my poetry. While we hear much of “anti-lyrical” poetry, while we see much of a kind of obscure surrealism in modern poetry, I lean more to the descriptive-narrative styles, with substantial content (in theme and image) and with a fairly strong dramatic quality. Derek Walcott is a major influence. In recent years, I have been writing much ekphrastic poetry, responding intuitively to visual art of all kinds, including photography. I honestly don’t remember, but I do recall early readings of George Lamming’s novels, Roger Mais, and I must have read Walcott. Once I got into Caribbean literature, in the late sixties, I read many anthologies of poetry and stories and grew familiar with the writers of the time. Without taking up the space, I can say that from the late sixties, before I went to Cave Hill, UWI, in 1969, I had become familiar with the major and minor writers of the time. My friendship with persons like Patricia Ismond, McDonald Dixon, Stanley Reid and Roderick Walcott enabled me to discover the canon of the time, to engage in discussions of our literature. So I could name quite a few if needed. In 1972, I was at the first Carifesta as a stagehand, and was privileged to be in the company of many of our writers who were there. Phyllis Allfrey, Jean Rhys, Louise Bennet, Sylvia Carew, Paule Marshall. Pulling these from top of my head now. Am not sure. Perhaps early pioneers like Una Marson. I need to read more of Wilson Harris. In some anthologies, I have seen poems by writers from the 18th century. Yes it does. I have a keen interest in literary history. I consider myself something of a “literary archivist”, collecting photos and other kinds of information about our Caribbean literary tradition. I would like to see more biographies of our writers (and artists) and more studies of literary developments. Anne Walmsley’s “The Caribbean Artists Movement 1966-1972”(1992), Andrew Salkey’s Havana and Georgetown Journals (1971,1972), Bruce King’s two books on Derek Walcott and the Trinidad Theatre Workshop, Eddie Baugh’s various books on Walcott’s life and work, Laurence Breiner’s book on Eric Roach and the politics of Caribbean Poetry (Peepal, 2008) are still pioneering works in a field waiting to be explored and filled. Many of the older writers are still important: Walcott, Brathwaite, Naipaul, Harris, Rhys, Lamming, Hearne among others. Lorna Goodison, Mervyn Morris, Earl Lovelace, Ian McDonald, the late Victor Questel, Dionne Brand and those who follow that first “Golden Age” generation. Many new voices have arrived, many of whose works are rewarded by big prizes: Kwame Dawes, Claudia Rankine, Marlon James, Vahni Capildeo, Kei Miller, Vladimir Lucien, Tiphanie Yanique, Ishion Hutchinson, Shivanee Ramlochan, Ann-Margaret Lim, Richard Georges, Jennifer Rahim among others. These and their many other colleagues are important. Time will tell, of course, how truly important and significant they are. Then there are many Caribbean writers who have grown up in the diaspora: Caryl Phillips, Zadie Smith, Andrea Levy and others. Peepal Tree Press, Carcanet and Papillotte Press are doing a great job in publishing the works of the older and newer writers. And we have not even touched writers from the other language areas of the Caribbean. Always too much piled up on my desk to read, lol. But these days I am reading Loretta Collins Klobah (Ricantations), Danielle Boodoo-Fortuné (Doe Songs), an English poet, Hilary Davies (Exile and the Kingdom,) Kwame Dawes (City of Bones), Jacob Ross’ short stories, “Tell no one about this.”. I have also been dipping into a casebook on the recently deceased Garth St. Omer and a fascinating book by Jean Antoine-Dunne, “Derek Walcott’s love affair with film.” This means finding time to read in between a full time job and other activities, including my theological reading and my own writing. But bit by bit, I get a sense of what our contemporaries are doing. In earlier years, I did more reviewing and often think I would like to do more again, in response to all I am reading and all that is happening.